Picking up where the events of the acclaimed Jesus of Nazareth left off, A.D. vividly recreates the turbulent years following the death of Christ. 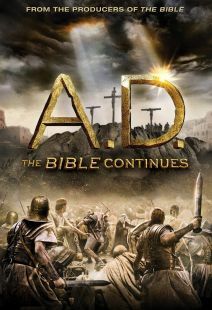 The earliest experiences of the Christian church after Jesus' ascension are powerfully dramatized in this remarkably authentic TV miniseries epic covering the years A.D. 30-69. 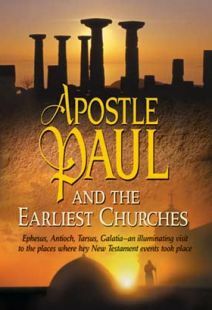 The perfect resource for any church or home study group wishing to explore the New Testament period, the Early Church, or the Book of Acts. In addition to the current NBC miniseries A.D.: The Bible Continues you might want to watch the 1985 TV miniseries, simply named A.D.,i most of which is available on DVD. Although both draw from the New Testament's Acts of the Apostles, the older version is far less violent—and, best of all, no Ninja angels. It does, however, like the current miniseries, weave in lots of fictional material, presumably to hold the attention of the causal viewer, as if there were not enough exciting material in the Acts of the Apostles. A.D. was a third part of a Biblical trilogy produced by Anthony Burgess and Vincenzo Labella. First they released Moses the Lawgiver; then Jesus of Nazareth, both excellent productions. The scriptwriters Anthony Burgess and Vincenzo Labella drew upon both Acts and the Roman classic The Twelve Caesars by Suetonius, and even the Ecclesiastical History by Eusebius. Thus there are lots of scenes in Rome during the reigns of the Emperors Tiberius, Caligula, Claudius, and Nero. There was so much material that the original series ran for 9 hours (this included almost two hours of commercials): the DVD version has been cut down to six hours (the actual running time is well under this—again, the "six hours" included commercials, which, of course, are omitted from the DVD). There are two fictional interfaith love stories interwoven between episodes dealing with the apostles, but I won't go into these. 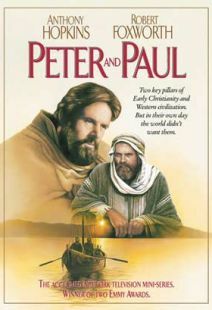 Pertinent here are the stories of Peter and Paul, excellently played by Dennis Quilley and Philip Sayer. The Pentecost event is presented with less flamboyance, meaning that there are no Roman soldiers chasing Peter and the apostles over the rooftops and through the streets. Peter and John's boldness before the Sanhedrin: the "Rock's" dream and visit with the Roman officer; his eventual martyrdom in Rome (by upside-down crucifixion, hence Eusebius); and, of course the conversion of Saul/Paul and a small portion of his travels and eventual martyrdom (by beheading) in Rome are depicted. Also included are the episodes of Stephen's martyrdom, the evangelist Phillip's conversion of the Ethiopian eunich, and the house church of Aquila and Priscilla in Rome—plenty for the believer to appreciate, though it must be extracted from teh two love stories of fictional characters. I wish that more of Paul's letter writing had been included, this being such a crucial part of the formation and maintenance of the early church. Also, the baptisms, as in most Catholic-influenced Biblical productions, are by pouring, rather than by the total immersion then in practice. These are minor quibbles, this version of the story being, for this viewer at least, far more satisfying than the new Hollywoodized miniseries. Stephanos - Abridged...but still a Keeper! This time we have the Jesus of Nazareth sequel on dvd(to the joy of die hard fans) only abridged for bible study/Sunday school purposes. 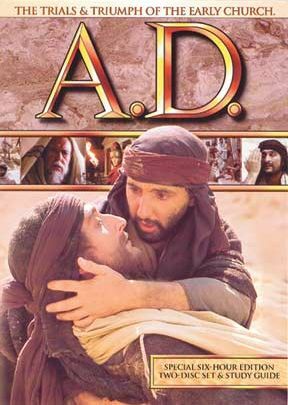 My review is pretty much the same as what I submitted for the full-length VHS version, but to finally see A.D. on dvd is a breath of fresh air. However, I'll give a full rating to the project as soon as i can purchase the full length, unabridged version on dvd...the abridged version is awesome, but the full impact of the movie is in the balancing of Church history and Roman history. The movie in itself is a masterpiece with alot of church history and a flair for Roman brutality. For entertainment purposes as well, I would like to purchase the original, uncut television version in DVD. Why is it taking so long is puzzling. The various aspects of history (Jewish, Christian, and Roman) were brought together in a most intriguing way. It's a profound and historical film. It will be useful with teaching in churches and religious organizations. Everything you want in a good movie. Love stories, character development ect. 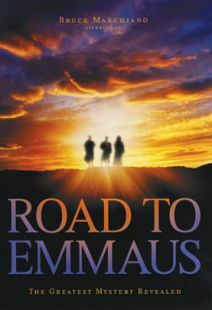 Saul to Paul and the arc of Simon Peter's character The movie follows the events in the book of Acts faithfully, while also providing insight into the culture of the greater Roman World. I watched it straight through all six hours. Shannon Lewis - A timeless Masterpiece! 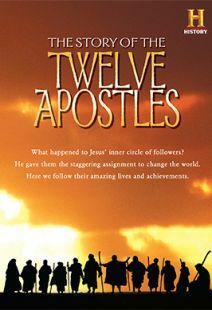 This is a beautiful and entertaining DVD set that combines Biblical and Roman history with suspenseful fiction. Definitely worth the purchase! However, I only wish that they had the original 9 hr version on DVD.